“There are three kinds of lies: lies, d***ed lies and statistics.” Mark Twain made those words famous. Keep them in mind as the US Supreme Court hears the case of Texas HB 2, which requires abortionists and abortion facilities to meet the same standards as other outpatient ambulatory facilities. Opponents just released so-called research to back up the idea that restrictions on abortion lead women to try to abort their babies on their own. They ought to slap a “buyer beware” sticker on their conclusions. TxPEP (Texas Policy Evaluation Project) commissioned the research. The time frame wasn’t specific to HB 2, which was passed in 2013. Researchers wanted to know how many Texas women had “ever” tried to do an abortion on themselves. Texas has almost 6 million women ages 18 to 49. Based on answers from just 779 of those women, researchers concluded that 100,000 to 240,000 Texas women have at some point tried to abort their babies themselves. Abortion has of course been legal since 1973, long before even the oldest of the women in the study might have sought an abortion and long before Texas passed protections for babies in 2011 and 2013. Of the women polled, 45 percent reported no problems accessing “reproductive health care.” So the fact that abortion is legal and accessible apparently played no part in their decision to self-abort. And the questions about someone else’s behavior didn’t stop with best friends. Another 2.3 percent said they suspected their best friend or someone else they knew had tried to abort on her own. Eventually the researchers did ask the women if they themselves had ever tried to abort on their own, and 1.7 percent said they had. That gave the low estimate of 100,000 women. The women’s speculation about other women gave the high estimate of 240,000. 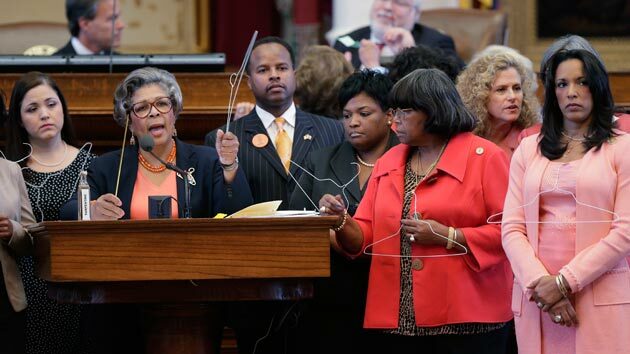 Pro-abortion Texas representatives discuss HB 2 while holding coat hangers, a favorite propaganda image. In the end, it’s the number that sticks, and 240,000 sounds scary. Never mind that it lands with a thud into Mark Twain’s categories. Want proof? Check out this headline. And see those coat hangers? One hundred percent of the women in another small TxPEP study used misoprostol, other medications or herbs to try to self-abort. Not a coat hanger in the bunch. And there’s the matter of who’s asking the questions. Some researchers came from the University of Texas Population Research Center, where TxPEP is based. The aim of TxPEP is to “document and analyze the impact of the measures affecting reproductive health” passed in 2011 and 2013. By now you know that “reproductive health” above all means abortion. Others came from Ibis Reproductive Health, where “increasing access to safe abortion” is at the top of the agenda, as is their project to keep late-term abortion legal, called Later Abortion Initiative. Others are affiliated with the University of California at San Francisco and the University of Alabama-Birmingham. All are published researchers, but they didn’t begin this study with a blank slate; they began with a pro-abortion agenda. So when you see statistics about abortion, whether it’s Planned Parenthood’s 3 percent myth or something like this TxPEP study, step back, give a nod to Mr. Twain, and look behind the numbers for the agenda. Please share this information far and wide, especially in Texas and with Texas legislators. This entry was posted in 2015, Abortion, Back-Alley Abortion, The Latest by Bradley Mattes. Bookmark the permalink.